Mill Spring, N.C. – To the roars of the home crowd, the NetJets® U.S. Jumping Team secured an historic gold medal in a thrilling jump-off against Sweden on Friday, September 21, in the FEI World Team Jumping Championship at the FEI World Equestrian Games (WEG) Tryon 2018. 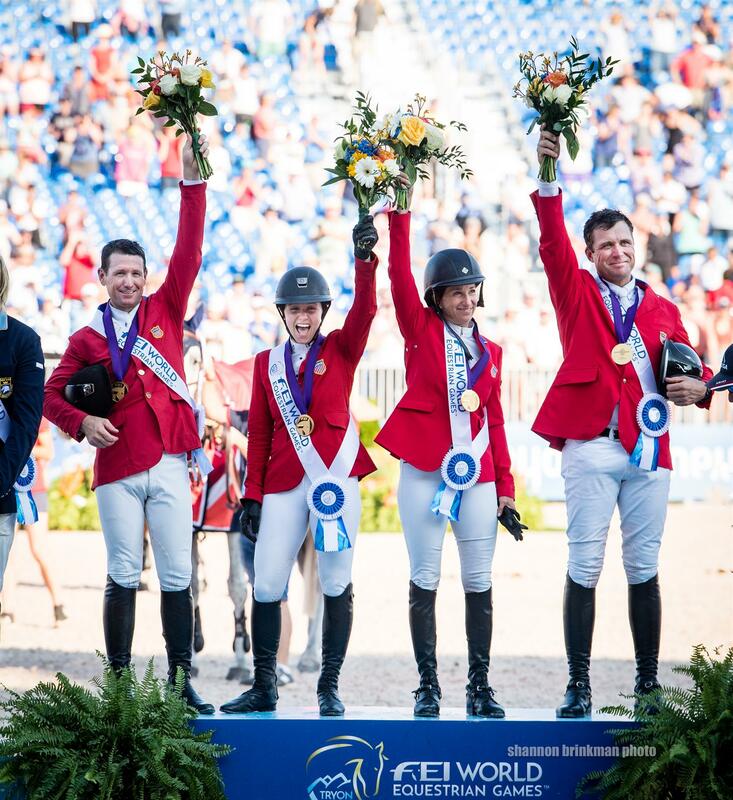 With this incredible finish, the U.S. team of Devin Ryan, Adrienne Sternlicht, Laura Kraut, and McLain Ward, led by Chef d’Equipe Robert Ridland, easily secured qualification for the Tokyo 2020 Olympics. Their team gold medal is the first for the U.S. in a world championship since they won in 1986. Starting out the day’s competition, Ryan (Long Valley, N.J.) and Eddie Blue, LL Show Jumpers, LLC’s nine-year-old Dutch Warmblood gelding, completed their first round of the day with a four-fault performance. Sternlicht (Greenwich, Conn.) and Cristalline, Starlight Farm LLC’s 10-year-old Bavarian Warmblood mare, also had four faults in the opening round. Kraut (Wellington, Fla.) and Zeremonie, Old Willow Farms LLC’s 11-year-old Holsteiner mare, scored an all-important clear round. It all came down to anchor rider McLain Ward (Brewster, N.Y.) on Clinta, an 11-year-old Oldenburg mare he owns with Sagamore Farm. When they had four faults, it put the NetJets® U.S. Jumping Team into a tie on 20.59 penalties with Sweden and forced a jump-off. The atmosphere was electric and filled with anticipation as Ryan and Eddie Blue entered the arena for the jump-off. Riding over the shortened course, they tallied a score of zero faults also set by the Swedish pathfinder Henrik von Eckermann on Toveks Mary Lou. Sternlicht and Cristalline had one rail down for four faults, equaling the four faults performance of Malin Baryard-Johnsson and H&M Indiana. Kraut and Zeremonie were fast and clear in the jump-off, keeping the U.S. and Sweden tied after a clear round from Fredrik Jönsson and Cold Play. Once again, it all came down to Ward and Clinta. After Sweden’s anchor, Peder Fredricson and H&M Christian K, were clear in 34.43 seconds, Ward knew what he had to accomplish and he did just that. He piloted Clinta to a masterful clear round in the fastest time of the day in 32.58 seconds to win this historic gold medal for the United States. While faults were equal between the U.S. and Sweden, their cumulative times were 102.73 seconds for Sweden and 100.67 seconds for the U.S.
“I knew the situation going in; I knew a clear would win,” said Ward of his first round. “I’m very grateful that I have such a great team, delivering great scores. Laura was clutch today. I’m glad I got a second opportunity to help our team win. Ryan, who is riding in his first championship along with Sternlicht, acknowledged the incredible year he has had leading up to this gold-medal moment. Kraut reminisced of her last gold medal-winning performance in the 2008 Hong Kong Olympic Games, which was also won in a jump-off, and felt that winning in the United States in front of a home crowd made it even more special. With the U.S. in gold and Sweden winning the silver, Germany rounded out the podium in bronze. The NetJets U.S. Jumping team will compete on Sunday, September 23, at 9:45 a.m. ET for the individual final. The top 12 return for a second round on Sunday to determine the individual medals.